For the third year in a row, the California Genealogical Society website, CaliforniaAncestors.org, has been honored by Family Tree Magazine. "A Fine State" by Contributing Editor Rick Crume (pages 20-27) is the cover article in the December issue which lists the magazine's 2012 picks for the seventy-five best U.S. state-focused websites for genealogical research. In selecting this year's best state websites, we looked especially for databases (at least one per state) where you can search for your ancestors' names. Thank you, Family Tree Magazine, we're honored to be one of three Golden State selections! Also chosen, for the second time, is the California Digital Newspaper Collection, founded by our director and Library Committee Chair, Dr. Henry Snyder. This site puts more than 5 million articles in California Newspapers (1846–2011) at your fingertips. This year the magazine added a third California website, SFgenealogy.com, founded by our members Ron and Pam Filion. In addition to extensive resources for the Bay area, this site has statewide indexes to birth (1905–1995) and deaths (1940–1997). Congratulations to Henry, Pam, and Ron, and a special "thank you" to Kathy Watson and Larry Youngman and the Website Committee for their continuing work for the society. You can read the online version of the article at the magazine's website: Top 75 State Websites of 2012. 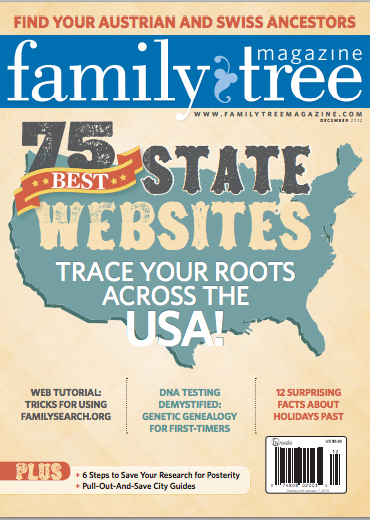 Family Tree Magazine is America's largest-circulation genealogy magazine, helping readers discover, preserve and celebrate their family history. In addition to their bimonthly print magazine, they publish how-to genealogy CDs, books, free monthly podcasts and weekly e-mail newsletters and the Genealogy Insider blog.